Sarah Barrow is Head of the School of Media at University of Lincoln, UK. She has published numerous articles on British and Hispanic cinemas and has a particular interest in Peruvian cinema. She co-edited 50 Key British Films (Routledge, 2008), was a contributor to 50 Key American Films (Routledge, 2009), and is co-editing a project for Routledge on world cinemas (2014). Stephanie Dennison is Reader in Brazilian Studies at the University of Leeds. She is co-author of two monographs on Brazilian cinema (Popular Cinema in Brazil, MUP 2004 and Brazilian National Cinema, Routledge 2007). She co-edited Remapping World Cinema: Identity, Culture and Politics on Film, Wallflower 2006 and Latin American Cinema: Essays on Modernity, Gender and National Identity, MacFarland 2005. She was co-editor of cinema journal New Cinemas (Intellect) 2010–11. Marvin D’Lugo is Professor of Spanish and Screen Studies at Clark University (Worcester Massachusetts) where he teaches courses on Spanish and Latin-American cinemas. His primary areas of film research include theories of authorship and the aesthetics of transnational cinema. He is author of The Films of Carlos Saura: The Practice of Seeing (Princeton 1991); Guide to the Cinema of Spain (Greenwood 1997); Pedro Almodóvar (Illinois 2006) and co-editor of Companion to Pedro Almodóvar’s Cinema (Wiley-Blackwell,2013). Since 2008 he has been principal editor of Studies in Hispanic Cinema. His current research involves auditory culture in the development of transnational Hispanic films. Tamara L. Falicov is an associate professor and department chair of film and media studies at the University of Kansas. Professor Falicov’s specialty is Latin American Cinema, with particular focus on the film histories of Argentina and Cuba. Her book The Cinematic Tango: Contemporary Argentine Film (London: Wallflower Press, 2007) was named an “Outstanding Academic Title” by CHOICE, the premier source of reviews of academic books, electronic media and Internet resources for higher education. She has researched numerous topics such as the Ibero-American film production fund Programa Ibermedia and issues related to multi-country co-production, the role of Hollywood in Latin American film production, young videographers in Patagonia, the film industry in Uruguay, and US-Argentine film exchange relations under the Good Neighbour Policy. She is the co-editor of the book series Framing Film Festivals by Palgrave MacMillan. Catherine Leen is a lecturer in the Department of Spanish, National University of Ireland, Maynooth. She has published articles and book chapters on Chicana/o cinema and literature, Latin American cinema and the work of Luis Buñuel and Guillermo Gómez-Peña. She was a Fulbright Scholar at the University of California, Santa Barbara, in 2008 and is an affiliate member of the Hispanic Research Center, Arizona State University. 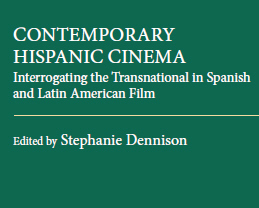 She is currently completing a monograph on Latina/o Filmmakers and Mexico and her volume International Perspectives on Chicana/o Studies: “This World is my Place,” co-edited with Niamh Thornton, will be published by Routledge, New York, in 2013. Alessandra Meleiro is Associate Professor of Cultural Production at Universidade Federal Fluminense, in Rio de Janeiro (Department of Arts and Cultural Studies). She has a PhD in Cultural Politics from the University of São Paulo. She holds a Post-Doctorate at the Media and Film Studies Programme (University of London). She is Scientific Coordinator of the Center for Analysis of Cinema and Audiovisual and Cebrap (Brazilian Center for Planning and Analysis). She is President of the Cultural Initiative Institute. She is editor of Escritura’s multi-volume book series World Cinema: Industry, Politics and Market and Editor of Escritura’s multi-volume book series Brazilian Film Industry. Deborah Shaw is Reader in Film Studies at the University of Portsmouth. She has published widely on Latin American film and cultural studies. She is the author of The Three Amigos: The Transnational Films of Guillermo del Toro, Alejandro González Iñárritu, and Alfonso Cuarón (Manchester University Press, 2013), Contemporary Latin American Cinema: Ten Key Films (Continuum: 2003) and editor of Contemporary Latin American Cinema: Breaking into the Global Market (Rowman and Littlefield: 2007). She is co-founding editor of Transnational Cinemas (Intellect). Nuria Triana Toribio is Professor of Hispanic Studies. She is the author of Spanish National Cinema (Routledge, 2003) and co-author of The Cinema of Álex de la Iglesia (Manchester University Press, 2007). She is co-editor of the series Spanish and Latin American Filmmakers for Manchester University. She has published on film festivals, contemporary Spanish film cultures, and new strategies of auteurism, particularly in relation to transnational financing, production and dissemination strategies. Her most recent work has appeared in Screen, Secuencias and Studies in Hispanic Cinemas. She is currently developing a manuscript entitled Spanish Film Cultures. Libia Villazana specialises in Latin American Cultural Politics and Policy and Transnational Cinemas with a particular focus on films co-produced Contemporary Hispanic Cinema between Latin America and Europe. She is the author of Transnational Financial Structures in the Cinema of Latin America: Programa Ibermedia in Study, 2009 and has published in numerous cinema and media journals including Framework and Journal of Media Practice. She is an independent documentary filmmaker: her most recent film, Latin America in Co-production (UK/PE 2007) was screened at the Tate Modern, London. She was also the Director of the 8th Discovering Latin America Film Festival, one the largest film festivals of its kind in London. Her recent research is informed by the fields of migration and transnational studies; she is currently developing a cross-disciplinary research project at the Institute for the Study of the Americas, University of London, on the cultural impact of Latin American migration in London. Clique aqui para acessar a bibliografia completa do livro.